What little girl doesn't dream of being surrounded by glitter and having their photo taken? Everyone loves the sparkle of it, and the texture. 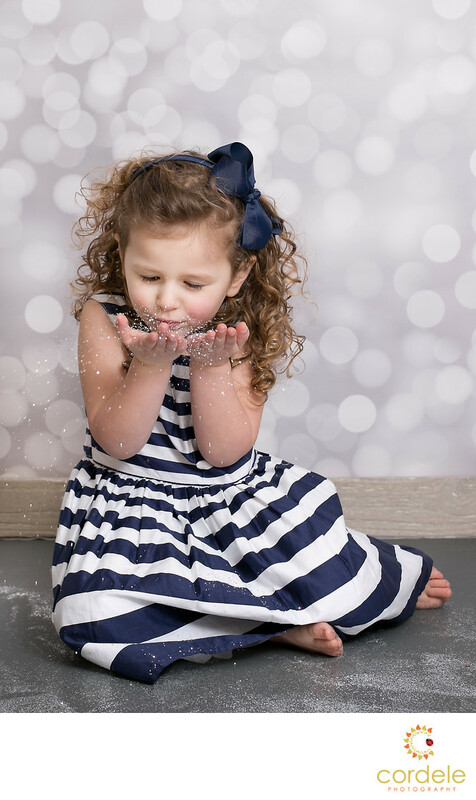 We offer these new glitter princess sessions where you play with glitter and we capture all of it. You throw it, you can roll in it, you can dance in it. We photograph your daughter having the time of her life playing in glitter. That's it. Leave the clean up to us! These sessions are not recommended for children under the age of 3. Glitter is messy and when kids touch their faces they can get it in their eyes and mouth. We recommend doing a regular princess mini session with us. We can set up props and make her feel like a princess. This glitter shoot is new, and you need a lot of glitter, but it's also a lot of fun. If you don't want this type of session we are able to customize your childs portrait for any theme you can think of. Have a theme you want to try? Haven't seen it done? Contact us. We offer model shoots free when it's a new concept and we aren't sure how it's going to turn out. Free shoots are limited based on the idea, but it's worth asking! We photograph people in towns all over, not just Reading. We have people come in from North Reading, Lynnfield and Wakefield. We also have people come from Woburn too. We also travel to our clients as sometimes it's just easier!